Generates audio ambiences from different audio files. Is there a better alternative to Aura? Is Aura really the best app in Audio category? Will Aura work good on macOS 10.13.4? 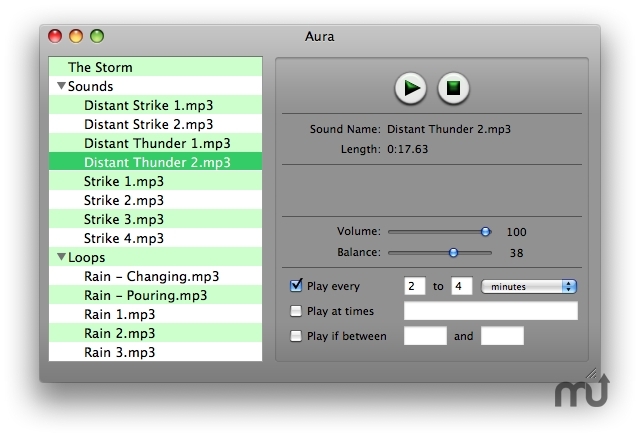 Aura is an application that generates audio ambiences from different audio files selected by the user, according to specific criteria of volume and frequency. You can use Aura to create a background ambience that will mask other distractions, like background noise or chatter. Or you can simply run an ambience to relax. You can create your own ambience files or download examples from 3Z Software's website (www.3zsoftware.com/en/aura/projects.php). A stream? A thunderstorm? A harbor? A building site? Open a project and play it. You will be immersed in the ambience of your choice. You can also create your own projects. Aura needs a review. Be the first to review this app and get the discussion started! Sounds - Add all the sounds you want to your project, adjust volume, balance and frequency parameters. Loops - Add one or more to your project, they will play one after the other, cross-faded, in the order you choose. One file, one ambience - All the necessary sounds and data are self-contained in a single file. Automatic Stop - Set an ambience to stop after a number of minutes (like a sleep timer) and choose if you want the computer to shut down or go to sleep. Multiples formats - Aura supports the following audio file formats: mp3, m4a, aiff, mov and wav.